If the answer to your question isn’t here, then have a look at the jargon buster on the Scottish Orienteering Association website, or there’s a comprehensive glossary of orienteering terms on the Mole Valley Orienteering Club website. How do I find out what events are on in my area? What do the different event levels mean, on the fixture list? Can I enter any orienteering event, even if I’m not a member? How can I tell how hard the courses are? What is Sport Ident, and what is an SI-Card? What do all the symbols and lines mean on the maps? What do the control descriptions mean? I already do cross-country running; why would I want to try orienteering? What are the advantages of joining a club? How does the Start procedure at larger events differ from local events? Q: How do I find out what events are on in my area? A: Events in this area are listed on the Events page of this website and also on the Scottish Orienteering Association fixtures page and British Orienteering fixtures list. There are often flyers available at events detailing future fixtures. Q: What do the different event levels mean, on the fixture list? Local (Level D) - Relatively informal and low cost events, aimed at club members and orienteers from nearby. May have a limited range of courses, which are identified by colour. Regional (Level C) - A larger scale of event, generally using orienteering terrain of a higher quality. Draws orienteers mainly from the local district. A wider range of courses, with suggestions for various age classes. Aims to provide competition against a wider group of people, but without travelling a long distance. National (Level B) - These events provide an opportunity for the more experienced who are prepared to travel in order to enjoy a wider variety of terrain and competition from orienteers from around the country on challenging courses. Courses are based on colour and age classes. Major (Level A) - These are important events such as the British Championships. They provide an opportunity to compete against the best orienteers in the country on top quality terrain, and offer the ultimate orienteering challenges in the UK. Courses are usually based on age classes. Q: Can I enter any orienteering event, even if I’m not a member? A: Anyone can come and try orienteering at any open event. It's probably best to start with a Local event, but you can try a higher level event if you wish. Even the highest level events usually offer some non-competitive courses suitable for beginners. Often you need to enter the higher level events in advance, though there are usually a few spare maps available for people who just turn up on the day (with a small surcharge). Many Regional and National events will be part of a league, such as the South of Scotland Orienteering League or the Scottish Orienteering League, so if you go to those, you have the fun of seeing your name in the league tables afterwards. Some events are “Closed”, i.e. only open to particular categories of people, e.g. a schools event. Q: How can I tell how hard the courses are? A: Most events offer a range of courses with varying degrees of navigational difficulty, so there’s something to suit all ages and levels of experience. The easier courses mostly stick to paths, while the harder ones require more complex navigation and advanced map reading skills. If in doubt, ask one of the event volunteers, who'll be happy to recommend a course for you to try. Usually the courses are “colour-coded”, with different colours indicating length and technical difficulty, with a consistent set of colours used throughout the country. A description of these is included in the Newcomer's Guide on the British Orienteering website. Q: Don’t you get lost all the time? A: Everyone gets lost sometimes, but working out where you are is part of the fun! So don't be put off, because after a few events you will become more confident, and as your navigational skills increase, you'll spend less time making mistakes. Q: Do you have to be able to run for hours? A: No, you don't! Courses come in a variety of lengths and navigational difficulty, so there should be something suitable for all levels of fitness. Participants can walk, jog or run, at their own preferred pace. You can treat the event as a competition, or as a leisure activity, seeing areas that you might not normally visit. Q: Doesn’t everyone just follow each other? A: No! All the participants on the same course will start a minute or two apart, to prevent everyone from following the person in front. Sometimes people catch each other up, but it’s never a good idea to blindly follow someone, in case they make a mistake or they’re not looking for the same control as you. Q: How do you know when you’ve got to the right place? A: Each control will have an orange and white marker, and has a unique code that you can check to make sure you’ve found the right one. Q: Can’t you just cheat and say you’ve been to all the controls? A: Everyone carries a small electronic device that must be registered at each control to prove you’ve been there. After you have finished, downloading will check all your punches, and you get a printout of how long you took between each control, so you can compare your time with other people, and discuss the route you took. Q: What is Sport Ident, and what is an SI-Card? A: Sport Ident is a timing system which is used for orienteering (and other sports) to electronically register the punching of control points. It consists of a small plastic SI-Card on elastic which is worn on one finger. This allows the competitor to quickly ‘punch’ the card into the hole in the top of the SI boxes to register their control point. The card contains a computer chip, which picks up data from each control point that it is ‘punched’ into. This data can then be downloaded at the Finish to give information about which controls the runner has visited, and how long it took to get there from the previous control. 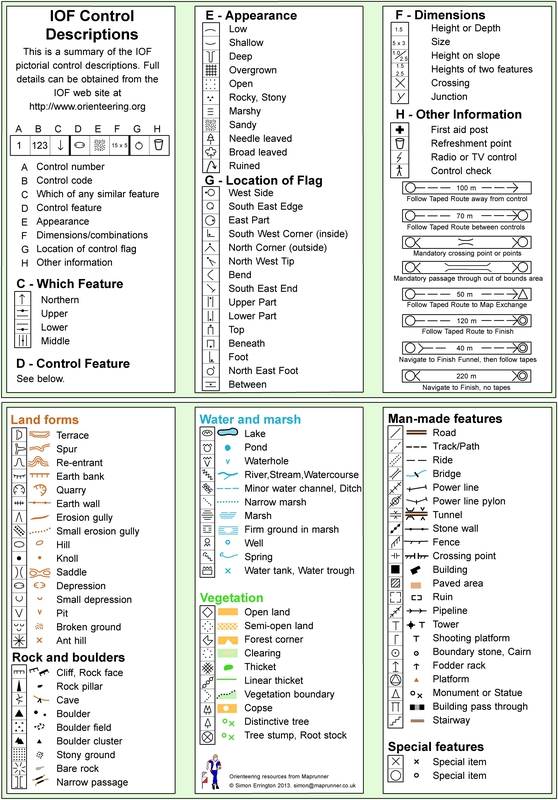 Q: What do all the symbols and lines mean on the maps? A: Most maps will have a key which will show what the symbols mean. 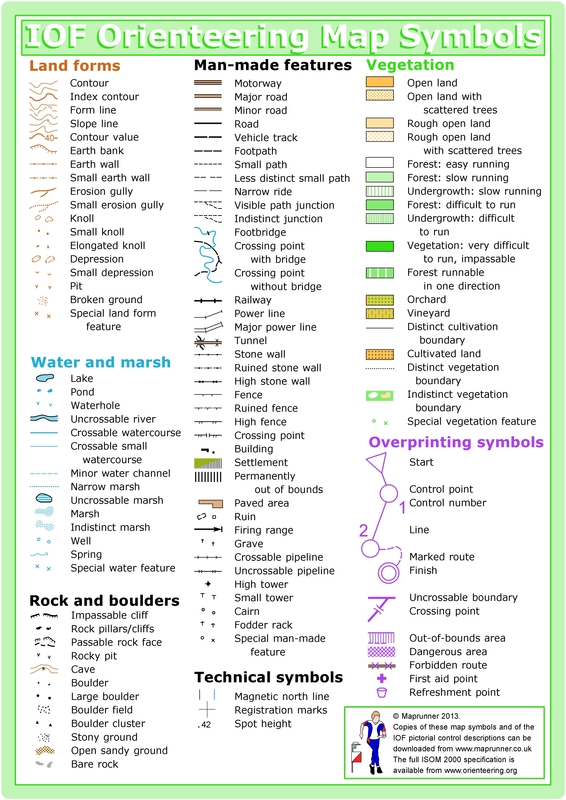 You may find this summary of the map symbols useful. Q: What do the control descriptions mean? A: Control descriptions can be written in words or, more usually, with IOF (International Orienteering Federation) symbols. This summary of control description symbols is helpful. If you need any explanation of your control descriptions, don’t be afraid to ask. Q: I already do cross-country running; why would I want to try orienteering? A: Orienteering adds a different challenge to your run. It allows you to go much further off-path than you would in normal cross-country running. You have comprehensive, detailed maps, which allow you to cover ground that you probably wouldn’t tackle in any other sport. It also works your brain as well as your body, because you have to keep a cool head as well as quick feet to get around in the fastest time. Since you are running on your own, against the clock, it is a great personal challenge. Q: What are the advantages of joining a club? A: It’s a good idea to join your local club for information, support and social events. Also, non-members often pay higher entry fees, and are not permitted to run competitively at the highest level events. When you join a Scottish orienteering club, you will automatically become a member of the Scottish Orienteering Association (SOA) and British Orienteering (the national governing body of orienteering in the UK); membership benefits include their magazines, support and information, as well as member discounts with various organisations and retailers. See the Membership Information page of this website for further details about ESOC membership. Q: How does the Start procedure at larger events differ from Local events? A: Larger events will have extensive pre-event competitor information, which will explain the procedures being followed. For most larger events, you need to enter in advance to be sure of getting a map, and start times will be allocated in advance. If you enter on the day, you will usually be allocated a start time at Registration, but you might simply go to the Start and be slotted into a gap. Make sure you get to the Start in plenty of time. The Start may be quite a distance from the assembly area, so check how long it should take to get there. At the Start, there will probably be a number of boxes marked out on the ground with tape. These boxes are to organise the competitors before their starts. You will be called up 3 or 4 minutes before your start time, and progress through the boxes minute by minute.You may need to punch the Start box, or it might be a timed start, where you simply go when the start clock reaches your start time. The start officials will explain this.